Despite the terrible Skype connection, it’s incredibly easy to connect to Marlena Grzeda. A Polish-born artist, she speaks from her apartment in Sibiu, in central Romania, where she now lives. The conversation is nicely disturbed by the birds’ chirp. Marlena is a Polish stilts walker, street theatre artist and costume designer, who says that she feels better on stilts than on her own legs. 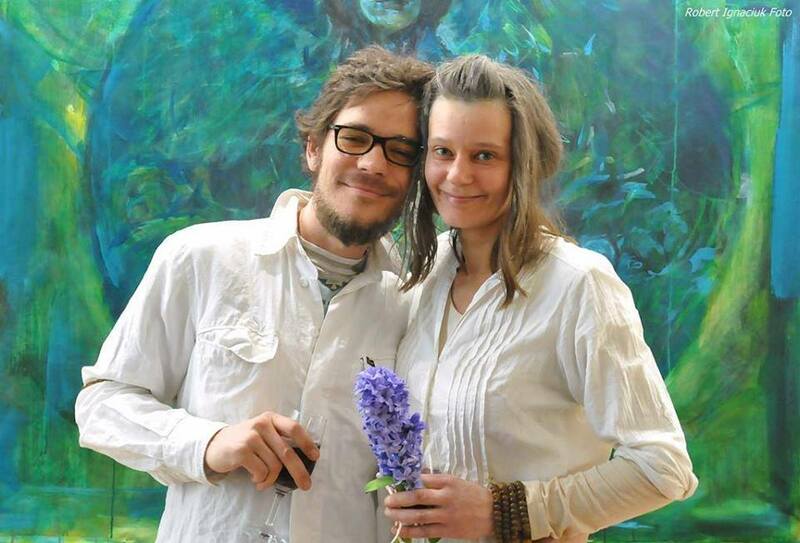 She has worked for many years with Teatro Pavana, a street theatre group in the Netherlands, but Marlena moved to Sibiu last fall to join her boyfriend, the painter Andy Ciocan (pictured below). In Romania, she started a new group called Pukima, which puts out walking act performances in Sibiu and at various festivals and events in Romania and abroad. Marlena was a natural stilts walker. She joined the rehearsal of a street theatre group when she was in her mid-20s, and the next moment she was trying the stilts. But this was followed by years and years of practice. Marlena has blue eyes and a big smile, which lights up her face. When she’s on stilts, her face is most of the times up in the clouds where people can’t see her smiling or crying. But most of her characters involve a lot of interaction with people. One of them was a five-meter high giraffe, whose neck started right where her head finished. She grew up in Dziwnów, in Northern Poland, close to the border with Germany. It was a fisherman’s village when she still a baby, but it’s a touristic city now. After a 12-year detour in Western Europe, Marlena has returned to Eastern Europe, and she is now starting a new life in Romania. In her first months in Romania, she spent a lot of time inside, designing the costumes, sending emails. She didn’t expect such a cold winter. But as soon as the spring came, she and her colleague Alex Curta have started rehearsing on the streets of Sibiu. They impersonate two characters coming from the childhood dream land, playing with comedy and emotions. Alex is the ground character while Marlena is the stilts walker, so their connection to people is very different. Besides the rehearsals, Marlena spends a lot of time sending proposals. While she was performing with Teatro Pavana, it was easier. Somebody else would arrange the gigs, and she’d just have to perform. But now Marlena is on her own. She sends several e-mails every day. “I try to grab theatre festivals, but also private parties for companies, wedding parties, all kinds of small events, like food markets. You have a lot of nice subjects to play around,” the artist says. She thinks that Pukima could be great even for corporate events, because it can bring a lot of color, without taking the focus from the main event. “We are discreet, but we spread good energy,” Marlena says. Their group has recently grown bigger, as Marlena has begun teaching somebody else to walk on stilts. Not only will he have to learn the technique, but he’ll also have to pay attention to the weather and all the exterior details that can influence the performance. When it’s raining, the costumes are getting heavier. But sometimes you don’t feel the rain, because you are hidden inside the costume. “And you just feel the drops on the fabric. And then you have to dry the costume,” Marlena says laughing. 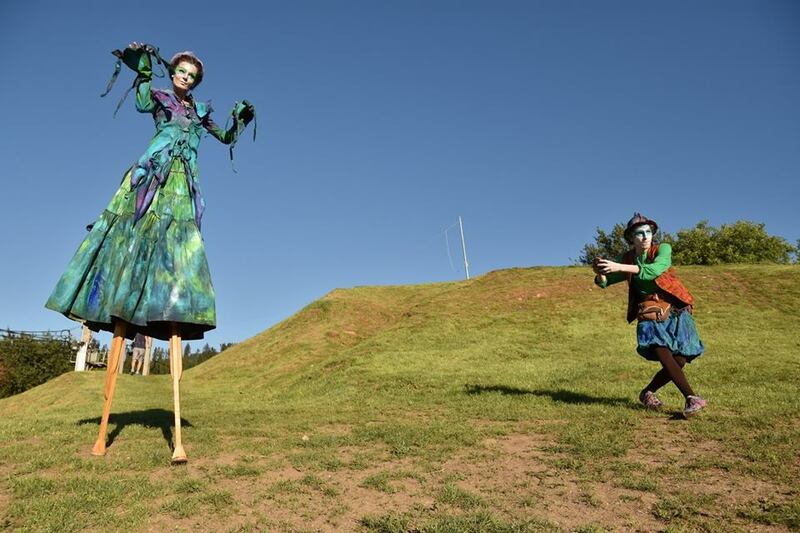 For her, stilts walking is magic, not only a job. “I think I will be a granny on stilts,” she adds.